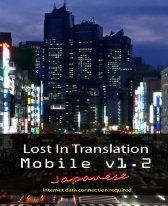 Lost In Translation v1.21 freeware for Windows Mobile Phone. Improved overall performance and minor bug fixes. Smaller cab file 50% smaller to improve device compatibility. DIdn't i read somewhere that google had closed its translate upi service? that couldbe why this has failed. Error message on WM 2003 is "[filename].cab" is not a valid CAB file." So I'm not able to extract it. Any update on upcoming release. Dear Sunrise, Any update ? Dear blahblahblah, Thanks, yes, that worked. But I cannot install because of memory problem. Sunrise is working on it and hope to get it installed soon. Waiting for the new release as v1.2 cannot be installed on my mobile. Dear Sunrise, thanks for the nice software. Since I have HTC touch and maximum free memory is only 17M. Can you do something to reduce the main memory requirement. This might be useful to many people. @seanimals: Thanks for the feedback, will look into adding support for (traditional) Chinese characters in a future version. @noname: try a different web browser to download the file, you also need a minimum of 20Mb+ free on your internal memory to complete the installation. I unfortunately get, "Installation of LostInTranslation.cab was unsuccessful." How do I solve it. It downloads .php file, how do I get .cab from it. Any help or guidance on this. Looks very useful. 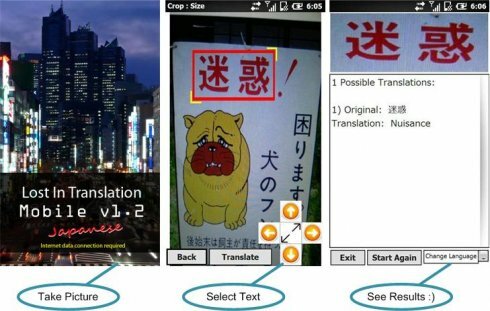 Does anyone know of a similar app for (traditional) Chinese characters?